A famous ultra runner once said to me “you have to go for the race that counts”. Two years ago, on a holiday in France, I found that race – the UTMB (Ultra-Trail du Mont-Blanc). 171km and 10,300 metres of ascent (and descent – there aren’t many flat parts on this run! ), 46.5 hours cut off time and two nights of running, following the Tour de Mont-Blanc hiking path through the Alps in France, Italy and Switzerland. And many glasses of wine I had to say no to! The Motor Neurone Disease Association - this is for my dear friend Mike Crisp and his family. Mike – you are one of the bravest people I know. I admire how you embrace life. The Ultra Sports Science Foundation – they do some fantastic research for the very sport I love and they are the organisation that is giving me the place in the UTMB. Thank you. I am so close to the race now! After three years of preparation, it is hard to believe that in 11 days I will stand at the start line of the UTMB. You can track me on an App called LiveInfo. My race number is 360. People ask me if I feel ready and I can honestly say that I do. I have had a very difficult time earlier this year - a DNF (my first! ), an energy sapping, demotivating iron deficiency which made it hard for me to put one foot in front of the other, and lots of other distractions which would have made it easy to stop training. But I didn’t - I kept running, made some changes to my nutrition and training and slowly, I felt the motivation come back. Of course, no one knows how I will feel on race day and none of this is a guarantee that I will actually finish the race - weather/ food/ how I feel on the day all play a part... but all I can do is give it my best shot. I have had my fair share of adventures during training. Night running through the English countryside (I know I scare people running through their fields and farms at midnight with my head torch but how else can I prepare myself for two nights of running I wonder), being chased by cows and various other animals, getting lost in the Alps and being rescued by a lovely Italian farmer (whose homemade schnapps was the last thing I needed after 25 miles of running...), crawling / climbing / dangling off snowy slopes in the Alps, torrential rain in Dorset and such strong winds across the Yorkshire Moors that I had to duck down to be closer to the ground... perfect preparation for what might happen during the race! I keep imagining how I will feel during the race. It fills me with so much excitement to think of the start, the atmosphere and hopefully the finish. I am still fund raising for the Ultra Sports Science Foundation and the Motor Neurone Disease Association. 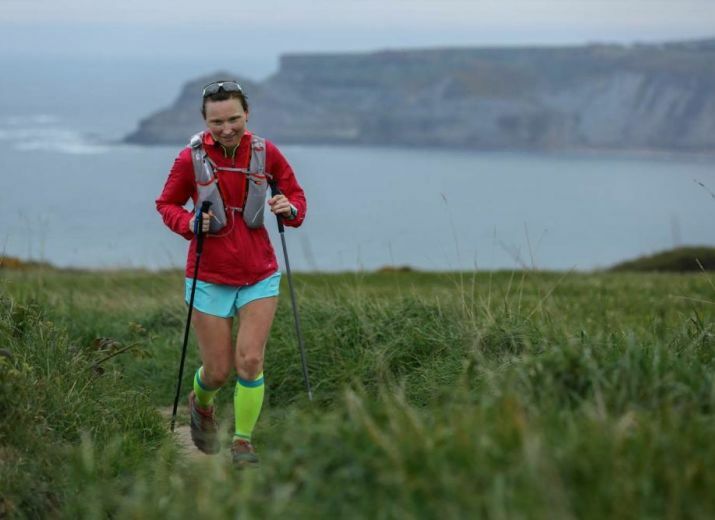 This weekend I am running The Oner - an 82 mile race along the South West Coast Path in Dorset - as preparation for the UTMB in France later this year. Following a training plan provides structure and gives me confidence. But what if the plan doesn’t go to plan??? I have struggled with training this winter - the weather has made it difficult and whilst I always say that I train in any weather, it’s really tested my will power. Nevertheless, after lots of miles through mud and very wet fields, it is now time to focus! The week before a race is always a rollercoaster - feeling anxious and excited at the same time, blocking everything out around me and just zeroing in on the challenge in front of me. The last few runs are short and a good time to enjoy being out and reminding myself why I love to run - it gives me a sense of freedom. I plan my races meticulously - a spreadsheet for checkpoints and cut off times, food before, during and after the race, clothes and kit... and everything in huge quantities: food, water, energy drink, shoes, socks, spare batteries for my gps and head torch and not to forget mileage... But then, nothing ever goes to plan during a race, in particular in the latter part of the race as it difficult to train for this. So I have to be flexible, adapt and improvise - more about that after the race. Part of my motivation is to wonder whether I can actually complete the races I sign up for. It is always a fine balance between believing I can and feeling defeated. This time, I am definitely struggling with self-doubt and I am worried that I will be timed out. Admitting this is not easy and I nearly did not write this update. But - I am telling myself that it is better to get to the start line and fail than not start at all!!! As you know, I am running the UTMB for charity and any support gives me a boost and further encouragement to finish my races. Thank you to those that have already sponsored me. If anyone would like to support me now, please use this website. Thank you! First of all, thank you so much for all the contributions so far. Very kind and much appreciated. I wanted to share with you my friend's blog - www.painintheals.co.uk. Mike has been writing about life with Motor Neurone Disease, his bucket list and his fund raising efforts. So inspiring and definitely worth a read! Well done Svenja! Amazing achievement! Well done! A fantastic achievement and a great cause. Very best of luck Svenja! Very good causes, all the best.